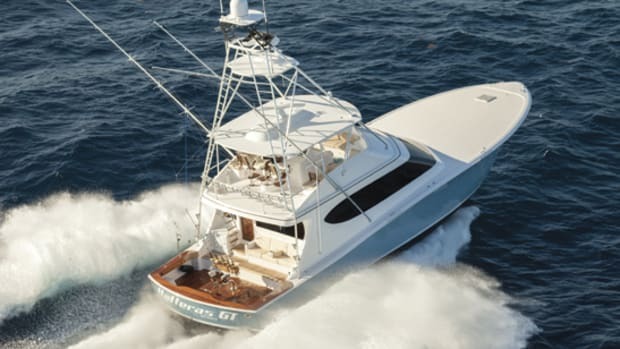 The builders of the 84-foot Orion from Bayliss Boatworks kept their eyes on both the forest and the trees, and the result is a finely crafted, highly functional, and undeniably fast sportfish. 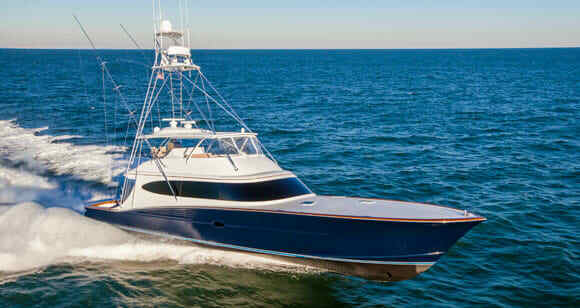 The suave, 84-foot convertible Orion presented new challenges for detail-oriented Bayliss Boatworks. 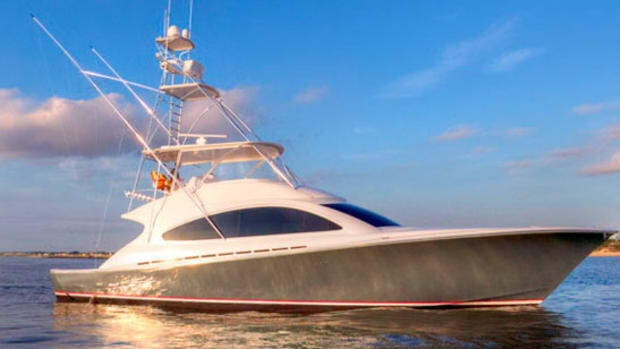 Her uncharacteristic dark, flag-blue hull, in-hull portlights, and the owner’s dictate to create a luxury yacht with a full-beam master were all firsts for the builder. 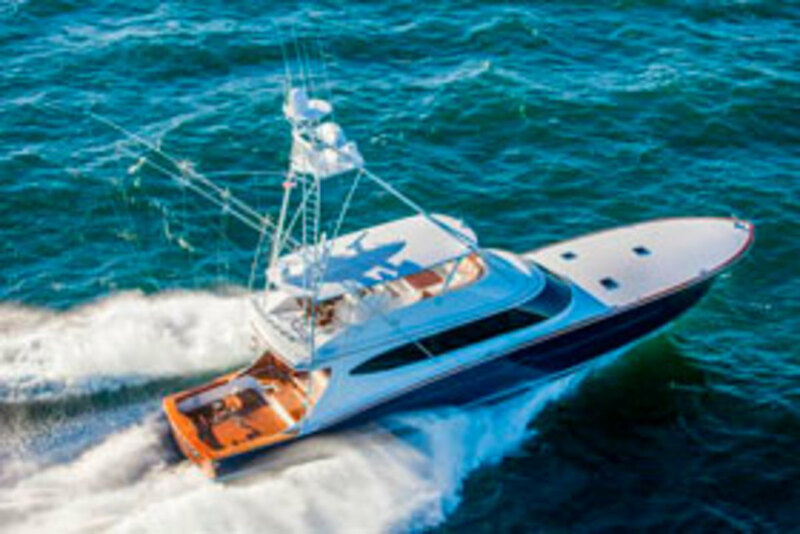 John Bayliss and his team adeptly mingled those parameters and delivered a stylish sportfisherman with a classic interior layout and décor. 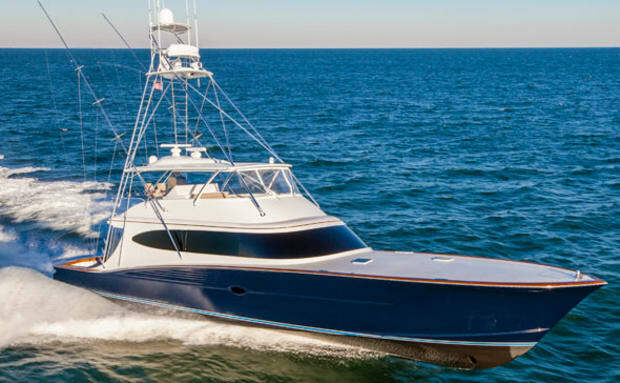 She’s a five-stateroom, six-head layout from the prestigious Wanchese, North Carolina, shop. During construction Bayliss transitioned to naval architects Donald L. Blount and Associates. They refined the arrangements as the build progressed. 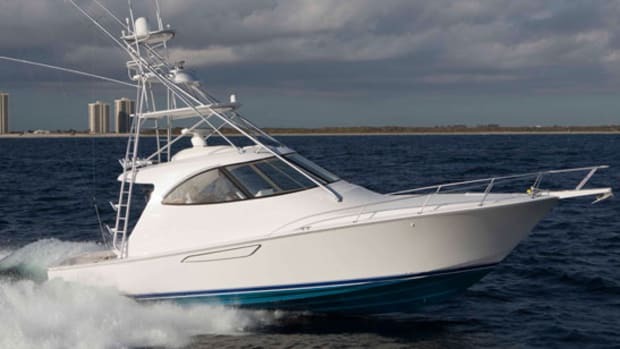 “Weight and hull shape are critical for providing a soft, dry ride, especially when speeds exceed 40 knots. Wood is strength critical. A properly designed cold-molded structure helps to dampen noise and minimize unwanted vibration. Propeller tunnels help to lower draft; they also generate transom lift when backing down,” says Chris Swanhart of Donald L. Blount and Associates. 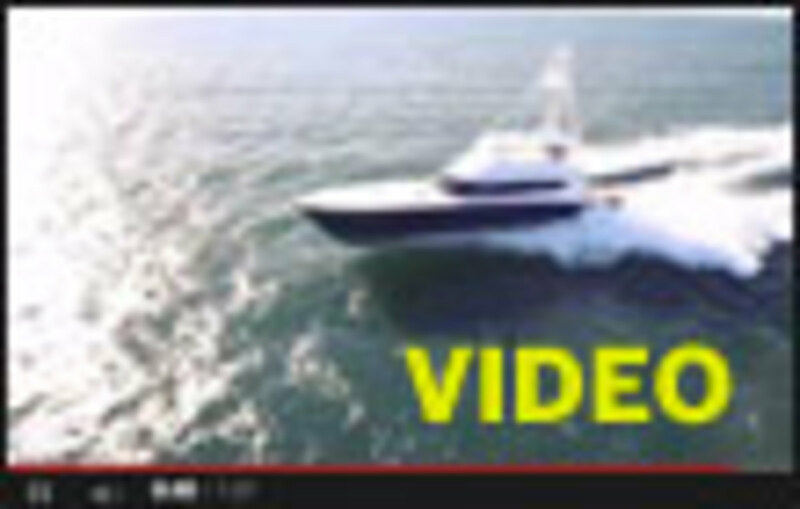 The sea trial supported the well-proven hydrodynamics of the hull. There’s basically no bow lift when pushing up the single lever controls, Orion just gathers speed and in a handful of seconds obtains 22 knots. Orion’s captain typically cruises at 1950 rpm. A glance at the GPS reminds you, what feels like a pedestrian pace is actually her 33-knot cruise. The decibel level at the helm was 97 but that was mostly moving water, literally white noise. Decibel levels flattened out at 1800 rpm and barely elevated throughout the power curve. There’s single access to the machinery from beneath a section of the cockpit mezzanine. That was the only option with the full-beam master layout. It takes a bit to clear the cushions and lift the large hatch to the companionway beneath. The controls for all the cockpit chillers and a pad for security dot the walls down to the engine room. The entry there is through a watertight door; there’s another on the forward bulkhead leading to a dedicated pump room. The use of chests provides an appendage-free hull allowing for more speed, clean water flow to the props, and minimal cavitation. Each main engine pulls 550 gallons of raw water per hour; intake size matters. The chests are large and have welded and hinged covering screens for easy maintenance. A signature element of a Bayliss build is a compulsion that no accessible space goes unutilized. The complete bank of batteries is housed in pullout drawers outboard of the engines; it looks like a solid bulkhead. A simple, low-tech sight gauge affords a quick eyeball of fuel level. Orion is layered with Soundown and other noise-attenuation materials so the gensets are sans sound shields for easy maintenance and accessibility. Removable hatches are under the saloon sole if an engine needs to be replaced. The aft saloon bulkhead is sized so an engine block can be extricated by removing the window with minimal intrusions to structure. The meticulousness continues in the interior. A pneumatically actuated door opens to a saloon that utilizes much of Orion’s 20-foot beam. There’s a teak and holly entrance (and galley sole) with a dayhead to port. All the joinery has a satin finish and is exquisite; cold air from the air conditioning pours from similarly finished valences 7 feet above. Under the upholstered saloon settees is wide-open tackle stowage. The owner opted out of one of the available high-tech lighting options here. It’s a straightforward system with the halogens strategically placed and not overly done. The galley and owner’s preference for a relatively small dinette work well. Five bar stools surround the peninsula countertop. They swivel and a retractable teak footrest flips down so diners can watch the cockpit action. The centerpiece master stateroom is accented with a beautiful maple burl. The portlights allow ambient light to enter the cabin; a Crestron system controls the portlight shades. A settee, desk, and en suite head fulfilled the owner’s desires. This cabin displays the heart of the Bayliss ethos—symmetry, exactness, and elegance. All the cabins have heavily crafted pocket doors for security and saving space. The four forward cabins, two guests with island berths and two with bunk-style berths, respectively, are mirror images of each other. Orion was designed to fish and the crew reports she’s friendly to fish and clean despite her size. The freeboard is mid-thigh on my near-6-foot frame and an 11-station Release rocket launcher is well off the transom. The teak is painstakingly selected and matches at every joint and seam. All brightwork originates from the same piece of lumber. 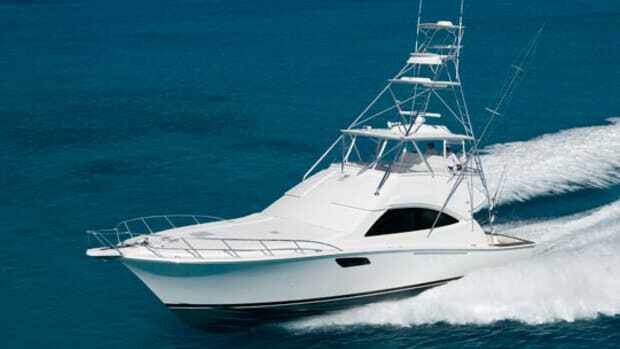 The flying bridge is a center console design with three helm chairs. The combination of Simrad and Furuno electronics fits nicely. There are compartments on either side of the helm for the MTU controls and the controllers for the systems. 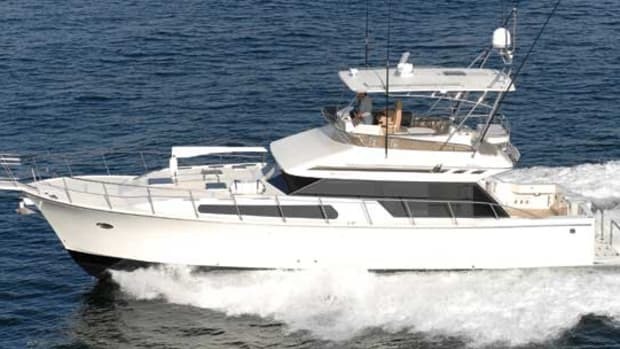 There’s an additional fishfinder tucked in the top, aft-facing for the captain as he looks back on the spread. Rod stowage, safety gear, and a dining area still don’t cramp the confines of the bridge. And freshwater is plumbed up there so washdowns don’t involve dragging hoses. 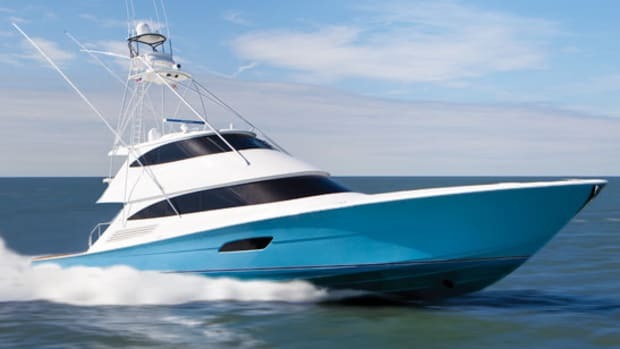 Virtually all of the Orion’s fishing, cruising, and performance faculties begin with her construction, and likewise, her construction begins with the architect’s 3-D models that transform into a jig that has been precut to precise measurements by a CNC router. These jigs are the platform for the four layers of Okoume plywood. Three layers of fiberglass and epoxy are the next phase. The hulls are cured as the layup is finished. Orion was baked at 165 degrees to post-cure epoxy before fairing. The fairing and paint prep are where the labor hours start to mount. Orion has an elaborate paint schedule with multiple layers of primer and topcoat. The hull was painted, sanded, and repainted. An arduous process, but necessary for a perfectionist like Bayliss; particularly when creating an unforgivingly dark hull like this one. 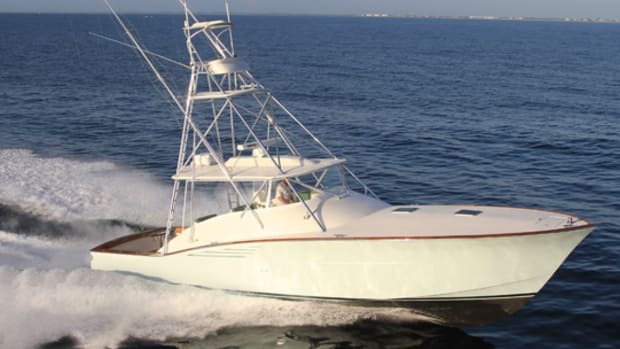 No two custom boats are identical, even those of similar dimensions from the same yard. 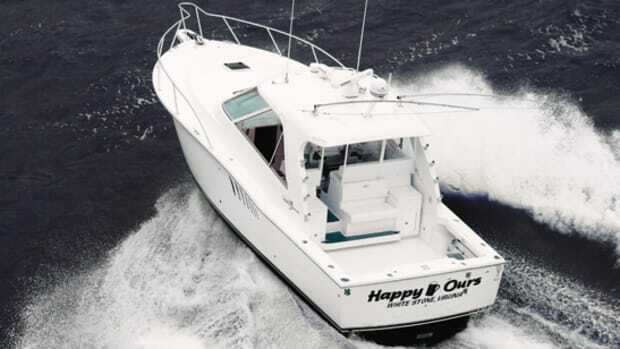 A custom builder is only as good as its last hull. John Bayliss gets that. In his own words, he “pushes past his comfort zone with every boat.” Bayliss is known as a hands-on guy that listens to his team and stays active in the field and the fishing circuit. His boats manifest that dedication and Orion is no exception. 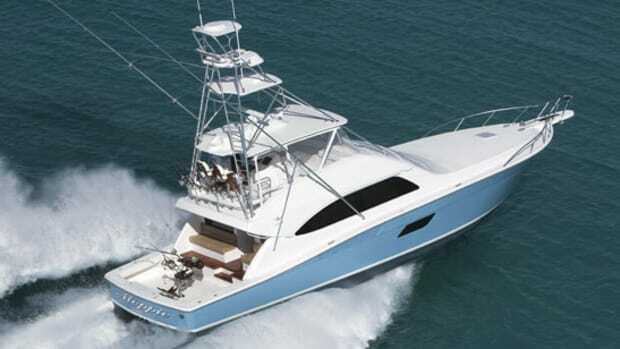 NOTEWORTHY OPTIONS: Rupp hydraulic outriggers; Simrad and Furuno Electronics package; Palm Beach tuna tower with costa enclosure; IceSea ice maker; FCI watermaker; centerline cockpit fishbox; Release rocket launcher; helm chair/saloon table; (prices upon request). 1,600 gal. fuel, 225 gal. water, 5 persons, full gear.